Single Head Rotary Lami / Plastic Tube Filling Sealing Machine can fill different type of tubes including Cosmetic Creams, Pastes, Honey tube filling machine, Gel tube filling machine, Gum tube filling machine, Balms tube filling sealing machine, Ointments into the Lami / Plastic Tube. Our machine operation shall be tube feeding tube filling tube sealing and tube coding(mfg, date, Expire, Lot No etc) Single operation with indexing we manufacturer Auto and semi auto Paste tube filling machine, Paint tube filling machine, Glue Tube filling machine, Adhesive tube filling machine, Ghee tube filling machine, cosmetic tube filling machine, cream tube filling machine, ointment tube filling machine, lotion tube filling machine, toothpaste tube filling machine, shampoo tube filling machine and viscosity material into plastic tube filling machine ,laminated tube filling machine or Aluminium tube filling machine, then to tube seal operation. 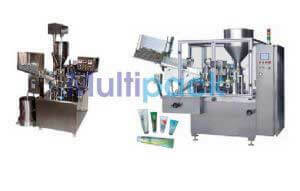 We supply many cosmetic tube filler machine for plastic and lemi tubes. Filling device: Positive suction & displacement PISTON typeAfter each filling stroke a control on tailing is achieved by a pneumatic cut-off system, along with filters, that cleans the nozzle of the excess sample. Piston Pumps (5 Gms. to 30 Gms.) or (30 Gms.to 100 Gms.) or (100 Gms. to 250 Gms.) Any one of the three sets will be provided against requested specification in your order. Trimming device: Pneumatics operated. At the separate station..
All Pneumatic components: FESTO Make. M/c. Dimensions : (L) 900mm x (W) 1200mm x (H) 2450mm.